So I noticed on Facebook that my cousin saw a Nova Special on PBS about Fractals. I love fractals. I think that quilt making is quite fractal like. 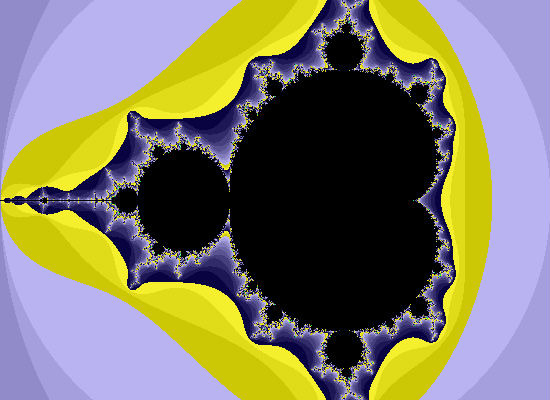 I went hunting for Fractal images to share. They are all mind-blowing. You should check them out. I made this fabric crochet bowl recently for my friends birthday. Happy Birthday Liz! I recently gave her the birthday bowl, so now I can share my creation. I make them out of strips of fabric. This one I used 1 inch pieces of fabric, so it looks chunkier. Now back to elfly duties. Ive been thinking beyond the normal reuse of gift bag, bow or shirt box. I purchased quite a bit of Christmas fabric back in January when it went on sale. I wanted to put to use so, I have decided on making draw string bags for gift giving. I hope that the receiver will be inclined to reuse. I used awesome ribbon as the drawstring and added bells to a few. I admit that I like glossy wrapping paper, however it takes up awkward space in my closet and year round which is a serious nuisance to me. I would like to use up what I have, and work toward future nullification of the wrapping paper. I think these bags will be good to give to immediate family, so I can explain my idea in hopes of getting them back. I don't think this will work for every gift I give. I would like to cut down on bags of paper after Christmas unwrapping. I have been a very busy elf. Sadly, I am unable to share these awesome handmade gifts in fear of some one seeing. I am very excited about the holidays. My In laws are coming, so I cant wait to decorate up big. My husband came home today and asked me to make these Darth Vader snowflakes. I am a huge fan of snowflake cutting so I am gonna give it a try.